Looking back over the last few reviews, it seems I haven't had an out-and-out failure recently. I think it's time I fixed that, so tonight, you can read all about Igloo Pop, and read why you should not play this game if you're old enough to read this site. Hell, you should not play this game if you're old enough to read, period. First off, let's discuss the most developmentally challenged theme ever put onto a game of nearly any kind. The story of the game is that a giant goes shopping for fish sticks, but forgets how many he was supposed to buy. So he picks up igloos and shakes them to see how many fish sticks are inside. But instead of chunks of breaded, frozen seafood, little Eskimo kids roll out and tell him how much fun they are having. It's as though the designer polled a room full of kindergartners right after he gave them all too much cough syrup. So just to understand - the giant is so stupid that he thinks a native Innuit village is the frozen food section? And then he shakes the houses, and instead of falling out the door screaming in pain and bleeding from the bones sticking through their major organs, these incredibly hardy children laugh and ask to do it again. I can't believe I'm supposed to buy this. The Eskimo kids got hit in the head, not me. Ah, you say, but what about the game itself? Surely I should be able to separate the game from the theme, and judge the game play on its own merits. And so I shall. In Igloo Pop, everyone grabs little plastic igloos stuffed with little plastic beads and shakes them to figure out how many beads are inside, then puts them on cards that show the number of beads they think are in their plastic igloos. There's a number on the bottom that tells you how many are inside, so you can check later and see if you were wrong - which is convenient, because you probably were wrong. You get points for being right, and you lose chances to shake igloos if you're wrong. So you probably won't get many points. Obviously, this is a game for children. Probably children who were shaken inside igloos by a giant who thought he was in a walk-in freezer. So maybe kids could get behind this stupid game. Not my kids - they're old enough to use the toilet (technically, they're teenagers, so they're old enough to foul the toilet, but not old enough to keep it even remotely clean afterward). Sadly, I don't even know any kids young enough to test this game - which is really not sad for me, if I'm being honest. It might be a big winner with the daycare-after-preschool crowd, but I don't know, because I really can't stand kids that small. They're almost always ill-behaved (except yours - your kids are amazing. Everyone says so... as long as you're in the room). 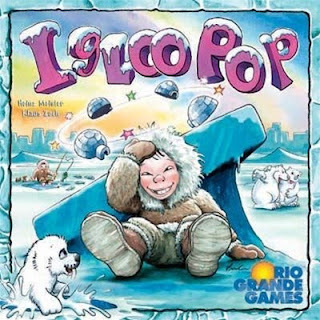 I want to write more about Igloo Pop, because this is a really short review. But the problem is, that's all there is to the game. How would you write a review of rock-paper-scissors? It would be tough, right? I bring that up as an example, because this is like reviewing a coin toss, only in this coin toss, it's likely none of you actually wins. I've heard from people who like this game. I don't see how, and I will be donating it to the local church-run preschool because I can't even be bothered to store it. But I have heard that there are adults somewhere who find this amusing. I don't want to meet those adults. And in the future, I need to be more careful when I request review copies. Is there an age limit on that one? I'm just saying, be careful: we don't want any small children swallowing the beads. An adult has to set up the igloos, and the beads won't come out once they're built. So there's really no choking hazard, once the game is assembled. There's just the hazard that you'll actually play the game, and get dumber. And you played THIS...and WROTE about it, instead of putting together Space HUlk, playing and writing about THAT chunk of awesome? Are you drunk? NO wait, if you were, you would have written something awesome instead of Igloo Poop. You need some Vodka man. I'll review Space Hulk next week. In fact, I'll run it Friday, but if you want to see the review early, you can go to Fortress Ameritrash Wednesday. But you know, I review everything I get. It's just not all good.